In the past few years, a concerted campaign to free India’s Dancing Sloth Bears has resulted in sanctuary for as many as 300 or more. Poaching had led to a dramatic decline of the wild population. 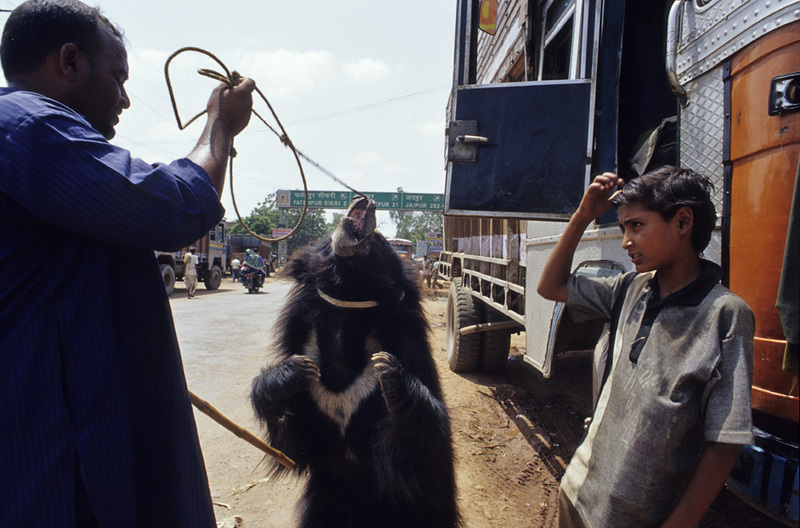 The cubs of parents captured by poachers, were sold to India’s traditional dancing bear owners the Kalandars, who for centuries trained them to entertain the local people. In recent times, their life of suffering and maltreatment, had extended to being paraded on the roadside hoping to attract tourist dollars. Without anesthetic, a hole was pierced through their highly sensitive muzzle or palate. Passing a rope through the raw hole ensures the handler can then control the bear. Any pain inflicted by pulling the nose rope upwards causes the animal to stand erect as if it were dancing. In this way, the spirit of the bear is broken, which gave the owner complete control. With teeth filed or removed, it effectively ensured they could never be returned to the wild. When I was last there, a few remaining bears and their handlers could be seen around Fatehpur Sikri in Uttar Pradesh. In this shot, I think the boy was as surprised as I was when all of a sudden the handler made the bear stand bolt upright, right there in front of us. How they are tethered is very cruel. When he requested money, it became very tense with me having to tell him what I really felt about the treatment of the bears. It finished up, him leading the bear away, very agitated, disgruntled and without payment.